At the invitation of the presidents of the National Academy of Engineering (NAE) and the City University of Hong Kong (CityU), Distinguished Adjunct Professor Asad M Madni delivered the invited keynote address, “Convergence of Emerging Technologies to Address the Challenges of the 21st Century” at the Grand Challenges Scholars Program (GCSP) workshop hosted by CityU, on August 14-16, 2018, drawing academics, employers, students, GCSP alumni, regional and global NGOs, and other aligned organizations to catalyze the embrace of the GCSP throughout the region. 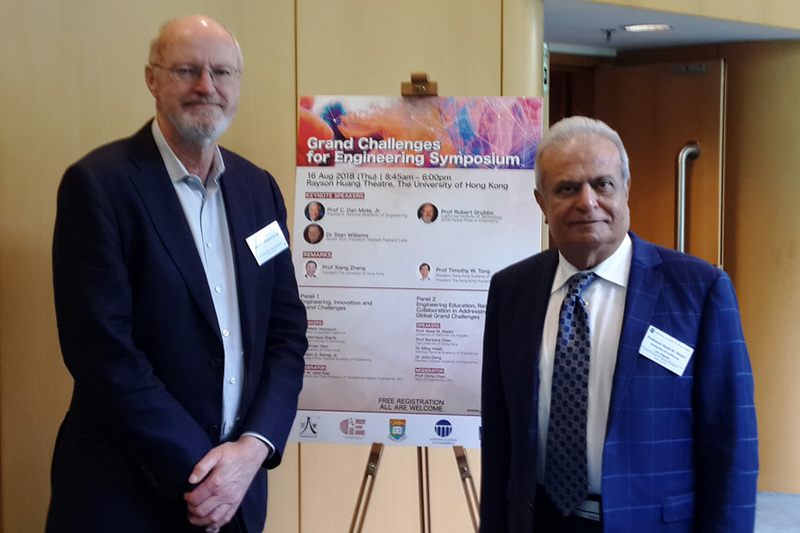 He was also a panelist and session leader on August 16, 2018 at the day long Grand Challenges of Engineering Symposium hosted by the University of Hong Kong (HKU) where renowned leaders from industry and academia came together to discuss the Global Grand Challenges movement and its impact on engineering, innovation, education, and research. Attached is a photograph with Caltech Professor Robert Grubbs (2005 Chemistry Nobel Laureate) at the HKU Symposium.